Sunday 11/17: I ran the 34′ Mirage today and we kept it simple going to the “secret tog spot”. The ride there was slow going due to heavy fog that never lifted until late int he day. Thanks goodness Furuno makes an awesome radar system! We setup at slack high tide and had action immediately. We were catching a lot of keepers at first, but as the Full Moon tide started ripping we began to catch more throwback fish. We ended the day catching well over 50 fish, 22 of which were keepers. Thanks to Off The Hook Bait & Tackle for the live Green Crabs that were the bait of choice. Tog (aka blackfish) are so fun to catch, and I love when our season opens up for them every Fall. 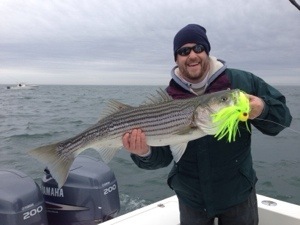 Looking forward to more days of tog fishing, and hopefully some stripers show up. 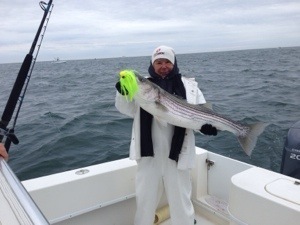 Saturday 11/16: I ran another trip on the 34′ Mirage CC in search of sea bass and tog on the Cape May Reef. The sea bass were not there so we anchored up on a wreck and picked away at tog all day long. 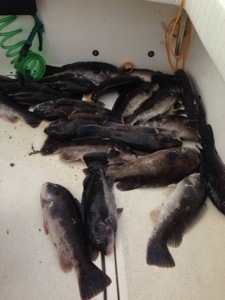 We caught a lot of shorts, but wound up with 14 keepers and had a fun day. Skies were overcast all day with winds out of the NNE at about 10 knots all day. The water temperature was 55 degrees. Friday 11/15: I took out the 34′ Mirage “Harbor Tails” today with plans of fishing for stripers in the DE Bay then playing with some tog around the Brandywine Lighthouse. We were met with a hard SSW wind and wind against tide made the fishing near impossible while chunking so we quickly switched gears to run in and try tog fishing. On the way in we had a fuel mishap, as in we ran out of fuel. Have to say, that is a first. I found out that the gauge only works on one tank and shows a false reading on the other. After Tow Boat US hooked us up with more fuel, we were on our way after a rather embarrassing boat mishap episode… We went to the “secret tog spot” and caught some tog and called it a day. Thursday 11/14: I mated on “Boss Lady”. We decided to go out front and try trolling for stripers. We had a consistent water temp in the ocean of 54.5 degrees all day, and a 3-5 foot tight chop with a 20 knot wind out of the SW all day. We had tremendous bait marks everywhere on most lumps all day, just no fish. Slow day overall, no fish to be found by anybody in our area all day.